This fall, the Harrington School of Communication and Media introduced the first-ever Introduction to Sports Media and Communication class taught by award-winning sports director and anchor, Yianni Kourakis. The course offers students a survey of perspectives on sports communication and media. It addresses the changing 24/7 landscape of sports media, the prevalence of social media and the merging branches of media including TV, print, digital, radio, podcasting, blogging and social. Kourakis comes to URI with a vast background in sports media. 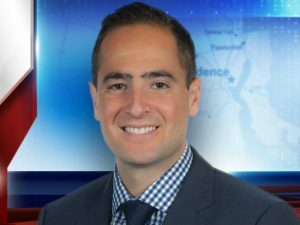 He is currently the sports director for WPRI 12 and Fox Providence. He anchors sports for Eyewitness News and hosts and produces the “Sports Wrap” nightly on Fox Providence, the “Patriots Wrap”, and “New England Nation”. Kourakis has covered all three Patriots’ Super Bowls since 2013, as well as the Red Sox World Series win. Prior to returning to his native Rhode Island, Kourakis was a sports anchor/reporter at WRIC-TV in Richmond, VA. In 2012 and 2013, he was named Associated Press Sportscaster of the Year in Virginia. He previously worked at WBOC-TV in Salisbury, Maryland, and the Mid-Atlantic Sports Network. This fall, the Harrington School rolled out an interdisciplinary minor in sports communication and media, with an array of new courses. Now, several faculty members are working on establishing a major in the growing and popular field. Students have also created their own sports media club.